from London Greens = od Londyńskich Zielonów?!? As some of you may know, 21st October 2007 was the day of Polish parliamentary elections. The queue to my polling station in London was extremely long, and, believe it or not, it took me about 4 hours to cast a vote! Feeling the national spirit, I obediently queued with hundreds of other voters. As we were getting closer and closer to the entrance door, I noticed a man holding a sign that made me laugh out loud. 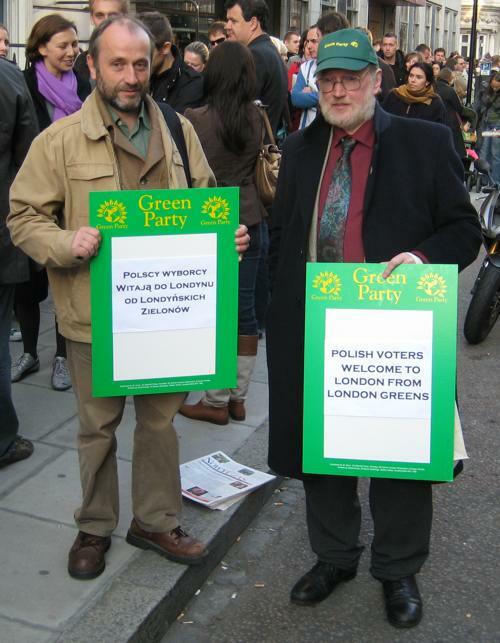 Here is what it said: “Polish voters welcome to London from London Greens.” And right next to it was a sign with the translation that read: “Polscy wyborcy witają do Londynu od Londyńskich Zielonów.” (apologies that only speakers of Polish can appreciate this.) You have to admit it sounds quite amusing! Especially, the “Zielonów” bit, which I still keep wondering about, as to what it can possibly mean. This is a classic example of “how not to translate”, or that checking words in a dictionary and just writing them down as they stand cannot result in a good quality translation, which in this case should say “Londyńska Partia Zielonych wita polskich wyborców w Londynie”. I just wonder how many more words, phrases, sentences, texts etc. translated in such a manner circulate somewhere out there?